Fair Isle knitting, also known as stranded colorwork knitting, is a technique for working two (or more) colors of yarn in the same row. It is fun to knit and easy once you get the hang of it. The color changes in Fair Isle are close together. This allows you to carry the yarn you aren't knitting with across the back of the work as you go. You will pick up each strand as you need it and this leaves a strand or float of yarn on the back side of the work. Fair Isle knitting is pretty easy to do and makes a nice warm fabric because all those floats add extra bulk and warmth. You will usually want to hide the back side of the work. That makes this a great technique to use for small colorwork patterns on bags, sweaters, socks, and other projects where the back side doesn't show. Stranded knitting is often worked in the round, and it's even easier to do that way than flat. For the purposes of this tutorial, we'll work with a flat swatch and a basic pattern. This simple chart shows you how to make the sample in this tutorial. Although it's small, you could work out a little math and continue the repeat for a larger project. Charts are helpful for stranded colorwork, as well as other types of patterns, so it's worth learning how to read a knitting chart. Start this chart on the bottom right, and work back and forth with each row, from bottom to top. To begin, simply cast on as you normally would and knit any plain rows called for in the pattern. In this case, it's 29 stitches and 6 rows of stockinette stitch, which gives your swatch a foundation and makes it easier to learn Fair Isle. 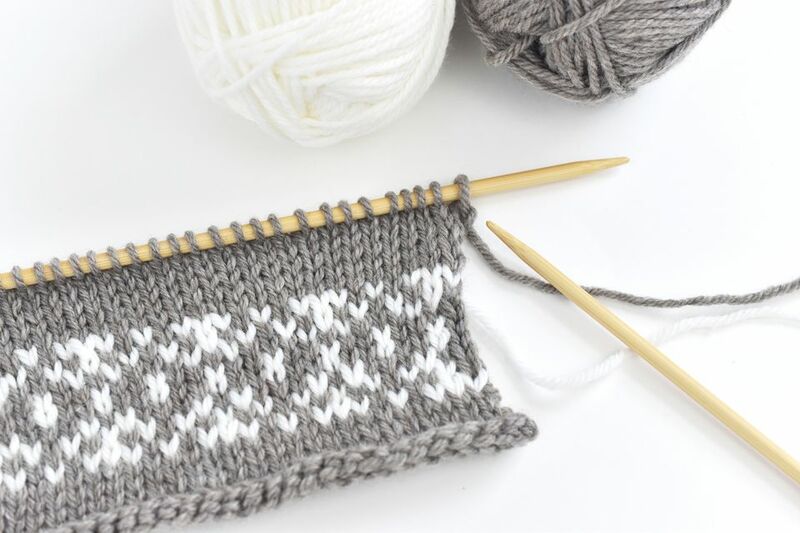 Working Fair Isle or stranded knitting on the right (or knit) side of a Stockinette Stitch fabric is easy and doesn't look or feel much different from working the knit stitch normally. For the first row of the pattern, knit one stitch in the background color. Insert the needle in the next stitch, then wrap the yarn around the needle with the new contrast color and complete the stitch. This is similar to joining a new ball of yarn at the edge of your knitting. Leave a tail for weaving in and simply begin knitting. Following the sample chart, work two more stitches in the contrasting color. When it's time to go back to the first color, pass the yarn behind the completed contrasting stitches and work the next stitch with that yarn. To continue knitting, follow the chart from right to left (on the knit side), changing colors as necessary. It's best to pick up the new color you're starting from underneath the yarn you just finished knitting with. This keeps your yarns well organized. Make sure that you don't pull too tight when you change colors. If your stranding in the back is too tight, it creates puckers on the front of the work. Knit a little looser when you change colors. Try to evenly space the previously worked stitches on the needle before you work the first stitch in the next color. At the same time, you don't want the stranding to be too loose. If it is, you may snag a strand when putting on a sweater or sock. Aim for a bit of flexibility in the float, but not too much. It takes practice, which is why swatches are helpful. Knit in Two Styles at Once? A great way to work at a good speed while keeping yarn organized and your tension correct is to hold the two yarns with both hands. To do this, hold one yarn in your right hand and knit English style and one yarn in your left hand and knit continental style. Again, this takes practice, but it's worth learning (or at least trying) this method. Working the purl stitch rows is like any other knitting. But from this side of the work, you can really see what is happening with the strands or floats. As you did on the knit side, change colors as shown on the chart (remember to work from left to right on this row). Again, pick up the new yarn from underneath the old yarn. Continue on the chart and change colors when needed. With each new row, you'll see the pattern starting to show up. Pay attention to the tension, and make adjustments as you go. Remember, if this is your first swatch, it may not be perfect, which is why practice is important. On the purl side, you can't really see how the pattern is forming because of all the strands. If you're working a complicated pattern or just want to check up on how you're progressing, flip the work over periodically so you can see the knit side to make sure everything looks good. Now you know the basics of knitting and purling in the stranded knitting style. Continue to follow the chart, changing colors as needed and as described earlier. The most important thing to remember is to keep the floats loose. Blocking helps even things out, but it won't solve a problem caused by very tight floats. When you finish the Fair Isle or colorwork section of a project, there's often more knitting in the background color. If that's the case, cut the contrasting color yarn, leaving a tail to weave in later, and continue knitting as normal.